The benefits of drinking water are undoubtable. Drinking the appropriate amount of water a day helps maintain your body’s balance of fluids while also keeping your skin looking good. Because water has become the second most popular drink behind sodas, it seems like anywhere you go, there will be someone carrying a bottle of water. These water bottles, if not properly recycled, end up in landfills, creating millions of tons of trash and waste each year. There is a solution: Vero Water offers not only a great tasting water but a bottling system that is environmentally friendly. Introducing a state of the art water bottling system, Vero Water uses 2,000 times of less energy than any other imported restaurant bottled water. Our dishwasher safe bottles were designed to be reused and to keep our landfills to keep our environment as clean and environmentally safe as possible. 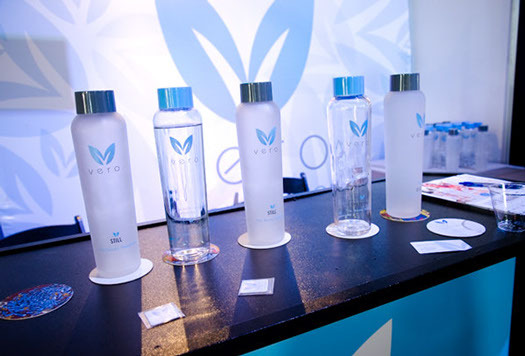 Vero Water also has a water charity that is dedicated to eliminating plastic waste, reducing the amount of carbon emissions and raising funds for providing clean water around the world. For Vero Water, eco-friendly bottled water is the absolute golden standard. Vero Water is making an impact on the way we interact with water. We’re dedicated to the environment and reducing the carbon footprint while keeping landfills free of plastic and glass bottles.